Cooper added to his win in Saturday’s race, but was left wondering what could have been in today’s race when back-markers hindered his progress and cost him time in pursuit of series leader and eventual race-winner Danny Buchan. Racing in tricky conditions, Cooper saw his deficit of just 0.4s extend to 2.5s in one lap after hitting traffic, and means he now sits 15 points behind in the championship chase with one round remaining. 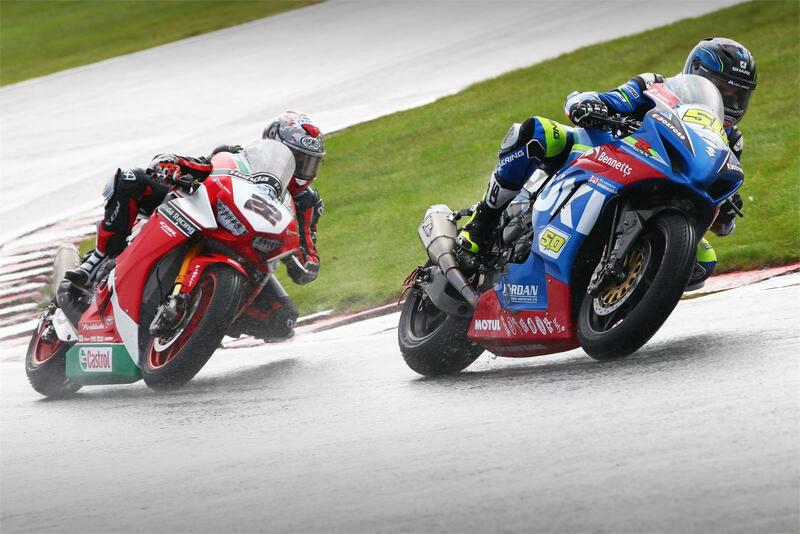 The opening Superbike race of the weekend took place in wet conditions, and initially saw Guintoli – flying solo in the Superbike class this weekend as Taylor Mackenzie recovers from a broken foot – making solid progress from his 16th-place grid spot. Moving his way towards the top-10, the Frenchman unfortunately crashed out of contention. “Another up and down weekend for us. Yesterday we were on a real high with Cooper’s win and the difference it had made to his championship, but today, while a podium is always a good result, it feels a bit hollow. Sat in second we felt he was in a strong position to at least take the fight to Danny [Buchan] and the pair of them could have raced for the win, but instead our race was ended early by lapped traffic and it could be what costs us and the new GSX-R the championship at the first time of asking. But that’s racing sometimes, and we’ll keep pushing and try and take it to the wire at Brands Hatch. “In the Superbike races, of course, we were a man down today, but Taylor [Mackenzie] is recovering well and we’re hopeful to have him back at Assen. Sylvain was flying the Bennetts Suzuki flag solo and to be honest the results probably don’t reflect the effort put in. Our qualifying position was disappointing and we didn’t have a good grid spot but in both races, in wet and some tricky half-and-half conditions, Sylvain was able to make progress through the pack.